The map to the right is interactive. Hold your mouse pointer over the highlighted places and they will be identified. Some of the places shown have a web page and can be accessed by clicking on them. Hill City is the type of main street small town USA that we have come to really enjoy visiting and wandering around in. The picture to the right shows a section of the main street with the covered boardwalk and some of the shops and restaurants. The town is the northern end of a steam railway through spectacular Black Hills country from Keystone to Hill City. Just a few miles south of Hill City is Silvan Lake and Lodge. The scenery is stunning and I'd strongly recommend a walk around the lake and perhaps a picnic there too. 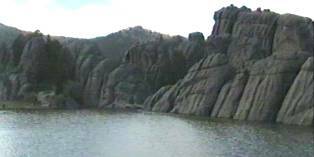 The granite rocks around the lake look almost unreal, as if they were created by Disney, but they are not, this is the real deal. The Lodge is a wonderful old building, but be warned, if you are staying there in the height of summer as we were, the rooms in the older part of the lodge do not have air conditioning. The ones in the new wing do, but we could not move. We spent one sweltering night there before moving on. Visitor post 31.7.01 Hill City has a mock shoot-out in early evenings during the summer. I think it is on Tuesdays and Thursdays but I'm not sure. It is the bad guys verses the good guys of course.